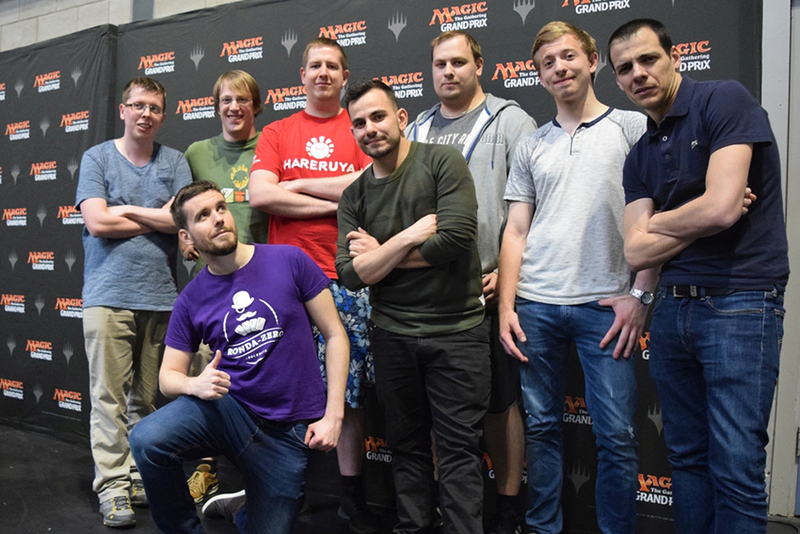 At the end of the first day, only eight of the original 1,200 players remained with a perfect record of 8-0 still intact: Sebastian Finkes, Johan De Gruyter, Grzegorz Kowalski, Andrea Cibak, Lukas Muller, Grant Fishman, Guillem Salvador Arnal (pictured below, standing left to right), and Sergio Ferrer Rozalen (kneeling). As always with Legacy, we had seen various cool decks throughout the day, and things like Elves, Mono-Red Prison, and even Steel Stompy were indeed represented here. However, half of these players ran Grixis Delver. Going into the weekend, it already was considered one of the big decks to beat; it didn't look as if many people had been able to beat it though.